If you are one of those people who has to pop every single bubble on bubble wrap, then the 2010 Bubble Wrap Calendar might not be ideal for you as you probably wouldn’t be able to last more than a week before popping all the bubbles on it. 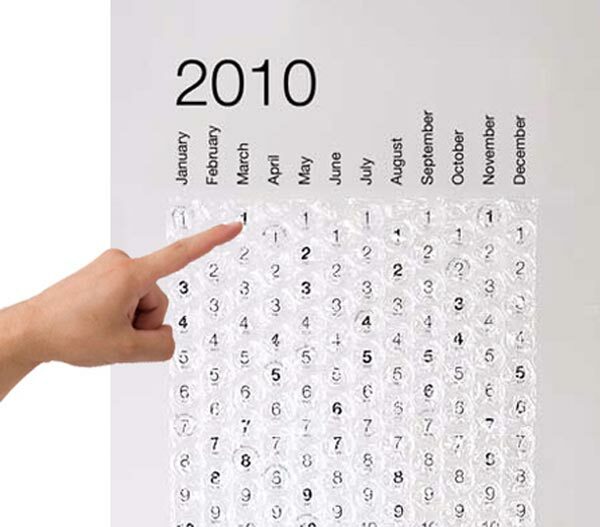 The 2010 Bubble Wrap Calendar features a different bubble for you to pop every day of the year, it measures 48 inches tall by 18 inches wide. The Bubble Calendar is appropriate for any design (and fun) conscious home or office. Just make sure that jealous friends and co-workers don’t pop your bubbles! If you want one, the 2010 Bubble Wrap Calendar ius available for $19.99 from Perpetual Kid.